I’ve been a casual gardener for the last twenty years, sticking some petunias in a pot, zinnias in the bed, tomatoes in a cage, anything to keep the place from falling into total overgrown entropy — with some success but mostly due to my wife who has the veritable thumb verte. Bamboo. Haven’t planted it but have been told it is evil. Chinese lantern: I got this disaster plant as a gift and it is taking over. We’re talking Invasion of the Body Snatchers. My mission in life is to eradicate it but I fear it’s too late. Pray for me. And now, I’m adding to the list: strawberries. For it is strawberry season and my garden is speckled with lots and lots of little ripening red balls of sweetness, just begging to be picked and sliced and scattered over my Cheerios. I planted two strawberry plants in the garden two summers ago, figuring, “hey, really fresh strawberries = good.” Then they spread. And spread. And spread. Now they own 25% of the bed. Yet I protected them with netting two weeks ago when the first berries appeared so the birds wouldn’t peck at them, but lo and behold, whenever I see one that looks ripe for the picking and worm my hand under the net to snare it I discover each and every one has a bite mark. Not the green ones, not the half-ripe ones … no, the vandal responsible for the ruination of my crop waits until each berry is right at its peak of perfection and it gives it a little chomp then leaves the rest for me. The villain doesn’t finish one berry, no, it bites every berry. Chipmunks are the issue but I can’t bring myself to exterminate them. Which gets me thinking about the psychological advantage squirrels and chipmunks have over their brethren the common rat. People don’t say “eek!” and climb on chairs when they see a chipmunk stuffing its cheeks with sunflower seeds under the bird feeders. But let a big grey, naked tailed rat appear and the exterminators are called in. It’s all about the tails and whether or not your species has been deemed cute by the cartoons. Chip and Dale and Alvin guaranteed the chipmunk would get immunity for life. No one can poison a chipmunk or set up a pellet-gun sniper nest to pick them off. But the rat… the rat gets Willard and that weird cartoon where a “nice” rat cooked French food in Paris. Rats equal the Black Death. Buboes and disease. Chipmunks equal Christmas carols sung in falsetto and good humored Disney mischief. After I salvage what I can I’m ripping up the plants. 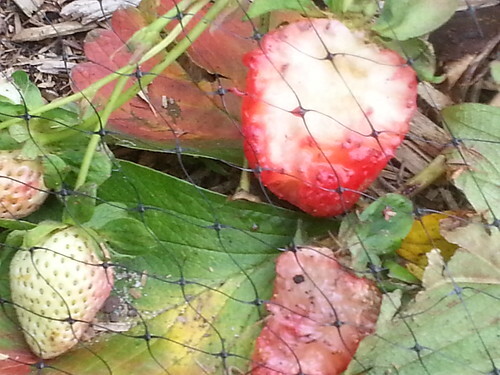 I can’t stand the tragedy of watching 11 months of strawberry plants turn into a chipmunk vandalism project ever again. I know I can cut the bitten parts off and make strawberry jam …. but who has time? “One of these horrid little insects awoke me in his struggles to penetrate my ear, but just too late: for in my endeavour to extract him, I aided his immersion. He went his course, struggling up the narrow channel, until he got arrested by want of passage-room. This impediment evidently enraged him, for he began with exceeding vigour, like a rabbit at a hole, to dig violently away at my tympanum. The queer sensation this amusing measure excited in me is past description. I felt inclined to act as our donkeys once did, when beset by a swarm of bees, who buzzed about their ears and stung their heads and eyes until they were so irritated and confused that they galloped about in the most distracted order, trying to knock them off by treading on their heads, or by rushing under bushes, into houses, or through any jungle they could find. Indeed, I do not know which was worst off. The bees killed some of them, and this beetle nearly did for me. What to do I knew not. Neither tobacco, oil, nor salt could be found: I therefore tried melted butter; that failing, I applied the point of a penknife to his back, which did more harm than good; for though a few thrusts quieted him, the point also wounded my ear so badly, that inflammation set in, severe suppuration took place, and all the facial glands extending from that point down to the point of the shoulder became contorted and drawn aside, and a string of boils decorated the whole length of that region. I have a nice strawberry patch in my back yard and around here it’s a real rabbit magnet as we have dozens of rabbits that seem to be taking over the neighborhood and pushing out the squirrels. I can’t bring myself to trap or shoot the little guys and God knows I’ll do hard time if I get caught shooting them with my Sheridan. So, I let my shepherd have some fun and she takes care of the rabbits rather efficiently. Having her act as an exterminator seems more natural to me and allows the Fates to play their hand. The rabbits are free to come or not and my shepherd is not outside in that part of the yard most of the time which then lulls the rabbits into a false sense of security. When I do open the gate and let her out, she is like a heat seeking missile running to the patch and looking for whatever invaders she can find. If she does find one, it’s usually curtains for them but if the rabbit does manage to get out under the fence, I suspect they’ll not come back very soon. Cruel? Perhaps. Good exercise for her? You bet! My only fear is that she tears an ACL in her frenzied pursuit. I have never eaten any of the strawberries, nor the raspberries that I grow. I grow them just for fun and because my grandfather did so for as long as I can remember. My grandfather would have found many other ways to cure the rabbit problem that might have involved gasoline or some other incendiary device as that was his cure for bees, ants and many other nuisances. Anyway, I prefer my fruits and vegetables to be genetically modified and covered in insecticides, so I don’t really mind not eating them. I hear bamboo is just big grass that spreads like the plague. If I had a panda around to keep it in check would be one thing. The Squirrellinator live trap would work on the chipmunks, plus provide the added bonii of letting you transport and release them on a mortal enemy’s plot for grins and giggles. Thinking of loading the Hav-A-Heart with some peanut butter, but last time I did that I caught a local cat who was not psyched. my squirrrels demand sliced chunks of apple, guave or passion fruits, plus whole (unsalted0peanuts. My running total for eight weeks is now up to 92. Took a lot of pictures years ago while riding my bike between Mashpee Lake and Oregon Beach and eventually made some postcards of Main St. Cotuit. The blue morning glories rambling up the south side of your house , appearing even bluer because of the contrast with the white paint , was one of my favorites . Sorry they won’t be making an encore – I’ll dig one out and send it along . While the flowers may have turned out to be a nuisance to you the mass of color was appreciated in an otherwise very white village. Def my nomination for gardener of the year ! Thanks. I’ll pass that along to the master gardener, my wife. And indeed, morning glories get very invasive, very quickly. Now it’s a constant battle to keep the vines from choking everything in their path.